This is your one-stop-shop for news and information about the new St. Paul’s. For the past year and a half, as part of the overall planning for the new St. Paul’s, the City of Vancouver has led a process to develop a Policy Statement that will guide the redevelopment of the Station Street site. The Policy Statement addresses land use, transportation, density, building types and heights, public amenities and integration with adjacent neighbourhoods as part of the development of the new St. Paul’s. Phase 3 took place in May, where members of the public had the opportunity to review the draft Policy Statement and early illustrations of a preferred development concept for the new St. Paul’s hospital and integrated health campus. 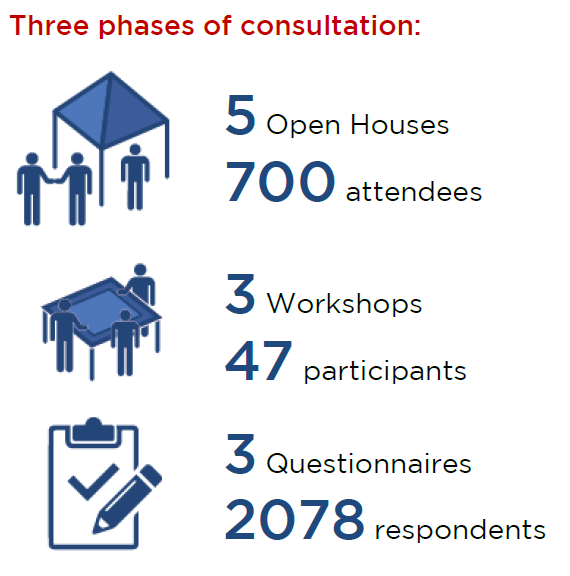 We’d like to thank those of you who participated in the various phases of public consultation — whether in the form of attending an open house or completing an online questionnaire. Following the last phase, City of Vancouver staff, members of the redevelopment team and members of the community attended a City Council meeting to determine whether or not the completed Policy Statement would be adopted. The consideration was successful and together we are moving into the rezoning and development processes. For more information and to remain up to date on future opportunities to participate in the ongoing City of Vancouver planning process for the new St. Paul’s, please visit vancouver.ca/newstpauls. For more information on the St. Paul’s Redevelopment Project, please visit thenewstpauls.ca or contact us at thenewstpauls@providencehealth.bc.ca. Check back often or join our mailing list to be notified of engagement opportunities.